If you live in Ontario like me you are not going to want to miss out on this chance for $1000 Metro gift card! There is a UPC entry and no purchase necessary entry as well. Enter a UPC from a Wong Wing product for your chance at winning a $1000 Metro gift card. You can enter 1 UPC daily. NO PURCHASE NECESSARY: Purchase is not required and does not enhance a person's chance of winning. 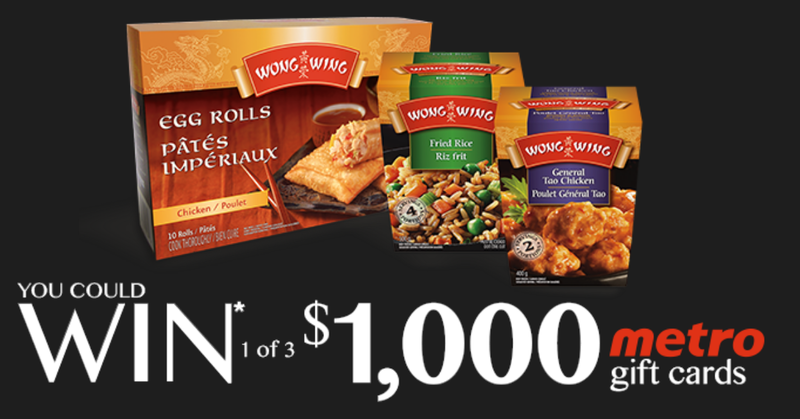 To enter without purchase, provide in writing, your name, full address, city, province, postal code, phone number (with area code), date of birth and email address along with a hand written original fifty (50) words or more essay about “Why you enjoy Wong WingTM/MC products?” and mail to: “Just Wong WingTM/MC It Contest - 3395 American Drive, Unit 11, Mississauga, ON L4V 1T5. All requests must be post-stamped no later than 11:59:59PM Eastern (ET) on March 4, 2019. The Metro gift card giveaway will be running until March 4, 2019.